Did the Habs Write John Scott's Hollywood Ending? Did the Habs Write John Scott’s Hollywood Ending? 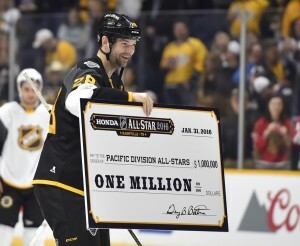 It wouldn’t have been much fun for the John Scott movie to end with him toiling in the AHL, far away from the NHL, both literally and figuratively. No one, including Scott himself, knows if he’ll get another contract for next season, so what a way to go out, suiting up for the most storied franchise in NHL history. It just didn’t seem right for it to come to an end with Scott buried in Newfoundland, all but forgotten. So perhaps the Montreal Canadiens motivation to call him up was fuled by more than just rewarding his professionalism. With the Habs season coming to merciful end, and nothing left to play for, surely the call-up was also about giving the fans some excitement in what was one of the most forgettable seasons in the team’s history. The loss of Carey Price to injury put a dark cloud over everything, as did the uncertainty over his return. Scott’s presence helped to quell the negativity that’s been surrounding the team, even if just for one game. But maybe there was more in it for the Habs than just some goodwill. After trading for the All-Star captain and sending him to the AHL under very suspicious circumstances, the Canadiens were suddenly pegged as the bad guys. Why did they take him in the trade? The Coyotes were just as much to blame, sending Scott away with his wife on the cusp of giving birth to twins. We still don’t know exactly why things went down as they did, but were the Habs hoping to save face? Imagine when the movie comes out. There wouldn’t have to be any creative editing to show that Scott got the short end of the stick in many ways. Class move by #Habs calling up John Scott. No certainty he’ll retire but if so, he gets one more chance to play in the show! The league and Gary Bettman will come across as mean and no fun, with the Habs and Coyotes being their partners in crime. Not really a good look. But now, with the call-up, the Canadiens look less like the villains, even though you could argue they still handled the situation quite poorly. Why did they wait this long? Why was it only for one game? We don’t know those answers, and probably never will. But John Scott got an opportunity that he won’t soon forget. He understands what it means to play for the Canadiens, and regardless of the circumstances, his usual good-natured and positive attitude chose to see the good in this. Overall, things probably should have been handled a lot better, from start to finish. But this truly was an unprecedented turn of events for everyone involved. Will the NHL, and the Canadiens, benefit from all this? Is that the real motivation? At the end of the day, I think the Habs did the right thing in allowing Scott one last kick at the can. Whether or not they had the best of intentions, we’ll never know. I want to give them the benefit of the doubt. Maybe they realized they had a shot at making this a true storybook ending. In that case, they succeeded. #Habs And there’s the ending for the movie, John Scott has been recalled by Canadiens. And in keeping with every good true story turned into a movie, you just can’t make this stuff up.